What's your favorite quote? “What you put out into the universe comes back to you.” – Ralph Waldo Emerson (The Law of Laws) What do you like to do in your free time? When I am not spending time with my family and friends, I love to read motivational and HR-related books. I refer to myself as an “HR nerd” a lot. I am also on the board for my local SHRM group as the marketing chairperson. I enjoy biking, walking on trails and watching my kids play tennis. In a sentence, why do you enjoy working at your company? Because we are challenged each day to think globally and act locally, I get the privilege of working with our talented staff on a wide variety of projects that makes a difference to RK Dixon and the customers we serve. In a sentence, how does your company have fun on a regular basis? RK Dixon promotes an “All In” culture, embodied by the engagement of our employees at all levels throughout the organization. We encourage our employees to participate in local community service projects (i.e. United Way events in all 8 of our locations, various festivals and chamber activities, etc. ), company sponsored events as well as we reward our employees for outstanding performance throughout the year. In a sentence, how would you describe the employees at your company? 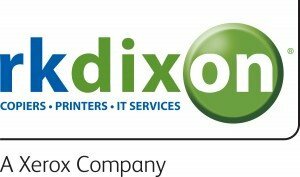 RK Dixon is a sales organization and our employees recognize that each person, no matter which department they are in, has direct impact on the success of the company. Every employee is “All In” (committed) to doing their best every day to make us successful.